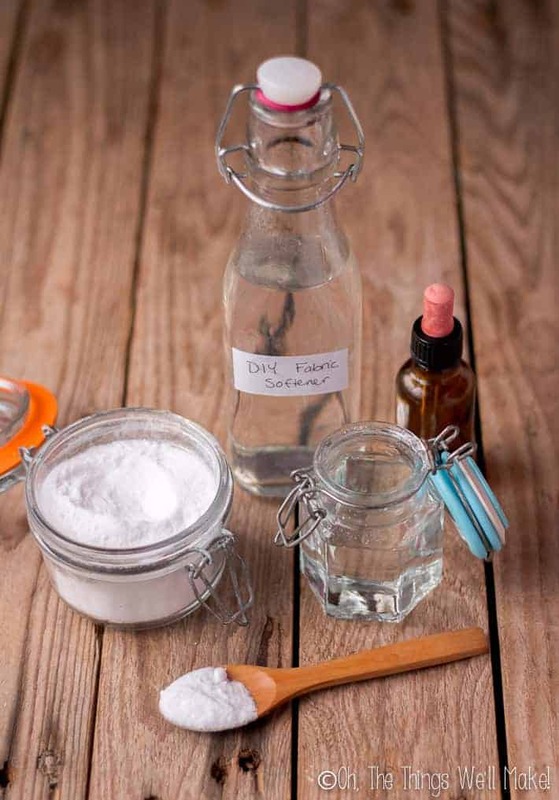 DIY Natural Fabric Softeners - Oh, The Things We'll Make! 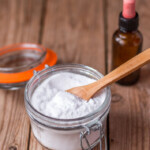 Skip the strong, artificial scents and chemicals in store-bought alternatives by using these DIY, natural fabric softeners that are inexpensive, easy to use, and non-toxic. 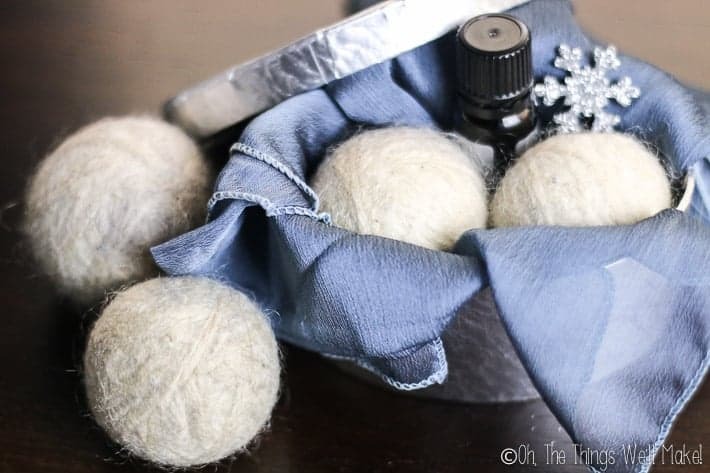 A couple of years ago, I showed you how to make wool dryer balls as a natural alternative to commercial dryer sheets. Wool dryer balls are great for throwing in the dryer with your clothes because they can help speed up drying time as well as help soften the clothes. Since I use an unscented homemade laundry detergent, I love to add a couple of drops of essential oils to the balls before throwing them in the dryer to give my clothes a very subtle, natural scent. Wool dryer balls can effectively soften your clothes in the dryer. While wool dryer balls are a great green alternative to commercial dryer sheets, an even greener alternative is to line dry your clothes, of course. Obviously, if you line-dry your clothing, you can't really soften it with wool dryer balls. I stopped using commercial fabric softener years ago. Not only do I find their strong, artificial scents overwhelming and nauseating, but I also was told by some of my local friends that commercial fabric softeners are responsible for eating away at the elastic on clothes. When I thought back to how long my swimsuits used to last me, and then how quickly they were wearing out once I had moved here (aka. when I started using fabric softener), I just stopped using it cold turkey. I mean, I really only had begun in the first place because I followed what everybody else was doing in this region with hard water. Do you really need to use fabric softener? Fabric softeners aren't necessary, but they can leave your clothes feeling softer. This is especially true for places with hard water. While I personally hate the scent of fabric softeners (and I actually secretly rewash almost everything my mother-in-law washes and gives back to me because I can't stand the fragrance), some people use fabric softeners because they love the way it makes their clothes smell. 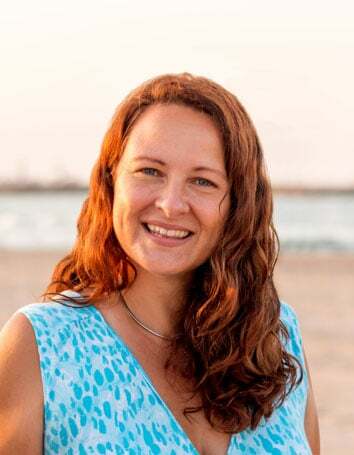 To be honest, I didn't notice a huge difference in my clothes after ditching the fabric softener, other than the fact that they no longer reeked of chemicals. That said, I made the change at around the same time as we moved to a new house, which meant it was same time that I started drying my clothes in the dryer again (with my wool dryer balls). Up until that point, I had been living in an apartment and drying my clothes on a clothesline. Clothes dried in that way have a tendency to feel a bit crunchier than those dried in the dryer. For those that do line dry, and I applaud you 100%. Luckily for you, there are easy, inexpensive natural fabric softeners that you can use to help soften your laundry without all of the toxic chemicals. Even if you use a dryer with dryer balls, I'm sure there are times that these natural fabric softeners can come in handy. So far, I've only tried using vinegar in the final rinse, but from what I've been reading, the other ideas here also work really well. 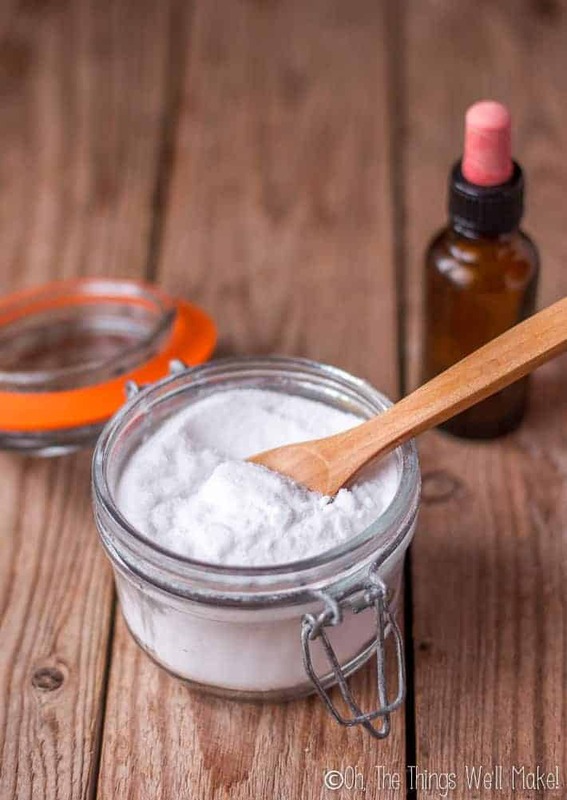 Baking soda has the extra benefit of helping whiten clothes, and helping to remove odors. You can use these natural fabric softeners alone, or combine them. I personally wouldn't combine vinegar (an acid) with baking soda (a base) because they would probably cancel each other out. On the other hand, vinegar and glycerin combined could make a great liquid softener, and salt and baking soda together would probably make a great powder one. If I do get around to trying them out together, I'll try to remember to update this post with my findings. Why choose natural fabric softeners? Commercial fabric softeners include a number of ingredients that are potentially damaging to our health and that can pose a risk to the environment. This culinary condiment is an effective cleaning agent that also works perfectly for softening your laundry. In addition, vinegar efficiently removes soap residue from your laundry and washing machine. 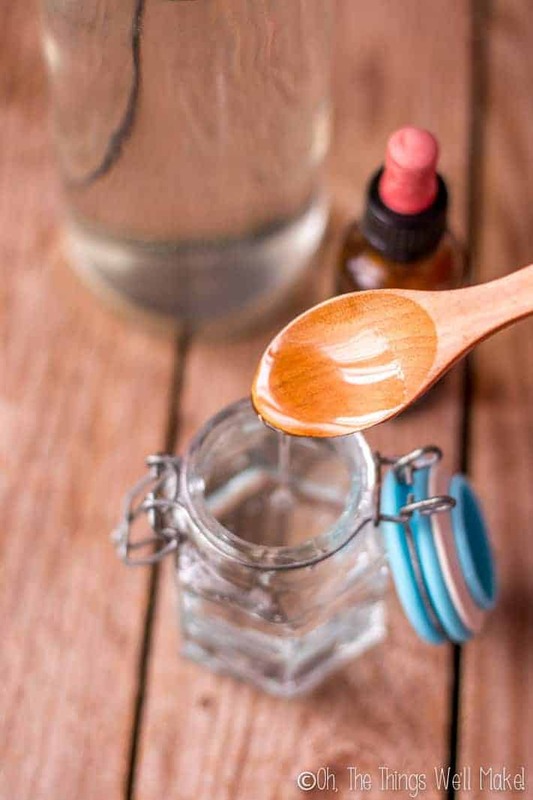 Mix together the vinegar and essential oils of your choice. 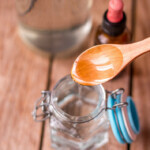 You can choose essential oils whose fragrance you like or can choose to use disinfecting essential oils. Pour the vinegar directly in your washing machine’s softener dispenser. You can use between 1/4 and 1/2 cup of vinegar in the final rinse of each load of laundry, dependent upon the size of the load and the hardness of your water. Baking soda is an effective fabric softener that is said to work by helping regulate the pH levels in your washing machine, preventing the laundry water from being too alkaline or acidic. It also can effectively neutralize odors and help whiten clothes. Lastly, it may help keep minerals in the water suspended there and from becoming embedded in the fabric. This will help keep clothes fresher, softer, and cleaner. Add 1/2 cup of the mixture (or just baking soda) to your washing machine during its rinse cycle. Salt is a wonderful natural fabric softener. 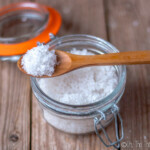 You can use coarse sea salt to make beautiful looking fabric softener crystals. Some people say that epsom salts make a wonderful fabric softener too that leaves their jeans feeling extra soft and smooth. 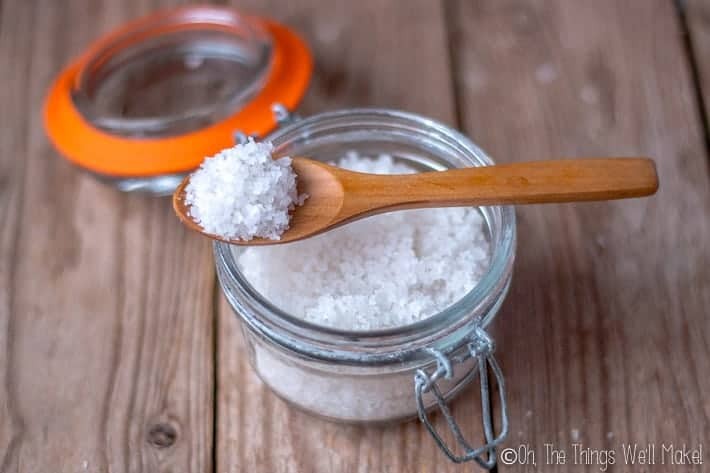 Others say you should only use NaOH salts (like sea salt or Himalayan salt) because the minerals in the epsom salts can build up on clothes or interfere with laundry soaps. I haven't found that to be the case, but I'd like to warn you, just in case. It may be more prone to causing issues for people with hard water. Mix the two ingredients together in a jar. Add around 1/2 cup of the salt mixture to your laundry. You can either add it with your detergent (allowing you to add vinegar to the rinse cycle), or you can add it during the final rinse. 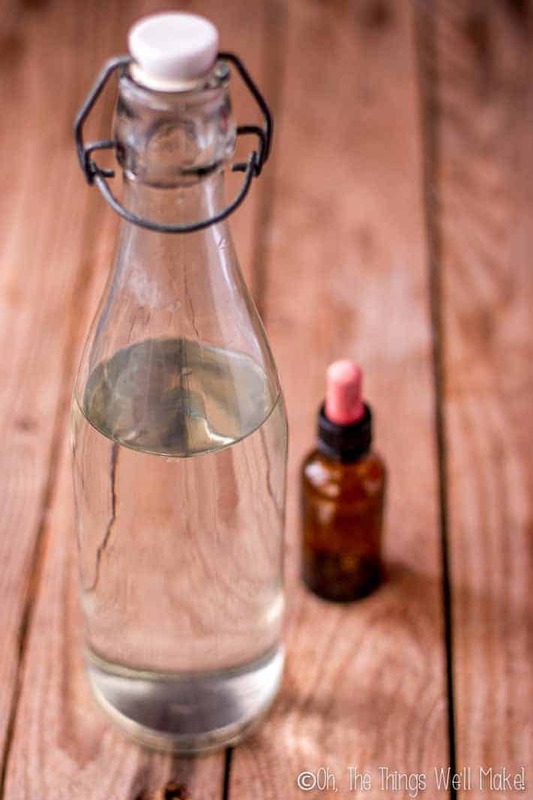 Glycerin is a budget-friendly, effective and natural alternative to store-bought fabric softeners. Pour the glycerin into a gallon bottle. 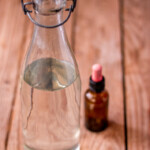 Fill the rest of the bottle with distilled water. Shake the bottle to mix the ingredients well. For a softer, chemical-free laundry, pour half a cup of the mixture into your washing machine during its rinse cycle. you saved me a lot of time, thanks for sharing the useful information. Can all these be used with cold water wash? I don’t have hot water going into my washing machine. We are also on an eco septic tank so are they all worm friendly? I don’t see any problem with the cold water. I wasn’t sure about the worms, though, and meant to look it up- but I completely forgot and almost didn’t answer you! I’m not sure about the worms because while these are environmentally friendly, coming into contact with a very high or low pH probably isn’t in their best interest. I would think, though, that unless you had the water run off directly to the area where you have worms for compost or something, that it wouldn’t be enough to be a problem. That’s just my best guess, though. I’m not completely sure. I’ve been using your fabric softener recipe…but I can still smell a hint of vinegar when I take my clothes out of the dryer. My husband really hates the smell…is there anything I can do to prevent this? Well, normally the scent disappears when dry, especially if you add essential oils to it. My husband also hates a vinegar smell. Perhaps you could either try with less (adding a stronger scented essential oil) or try one of the other recipes? Thank you! Been loving all your posts so far! I did just get a comment from someone who said that they still noticed the smell after the clothes dried, though. It may depend on the vinegar, or maybe she didn’t add essential oils. Perhaps, if you’re worried about it, you could start with a small amount and see how it goes- and then increase the amount as needed if you see that it doesn’t leave a scent. How many should I put it per each way? This had been a guest post by someone else, but I realized that it was lacking a lot of information and honestly didn’t like the way it was written. So, I just did a complete overhaul of the post and added amounts. Hopefully it will be more helpful now? thanks for adding the amounts, helpful. Hello Tracy, thank you for sharing the great information. I have questions. Is 3/4 cup of vinegar for one portion? And is it okay if I add the essential oil to glycerine&water? Thanks. I just completely re-wrote the entire post so that the amounts you use are clearer now! Hi, I also add essential oils to my baking soda and use that as a fabric softener. But I read somewhere that the oils in the laundry can start a fire in your dryer. Is that true? I only wash my clothes with cold water. No warm water for laundry where I live. That’s an interesting question, and one I hadn’t researched until now. It had been suggested to me years ago to add a couple of drops of lavender EO to my dryer balls, and I’ve been doing that successfully without issue for years. I found this interesting article which basically covers this topic. Basically they are saying that it is theoretically possible, but that it is unlikely because you are using such small amounts. I’ll be updating all of my laundry posts this week with the new information- so thank you for bringing the possibility to my attention. Where do I buy vegetable glycerin? You can usually buy it at cosmetic supply or soap making supplu type places. I always order it online.